Sure, it’s fun to be known as the paperless teacher. But it is much more important that the choices I make for my classroom help students learn and connect to the content. So, does going paperless really benefit kids? 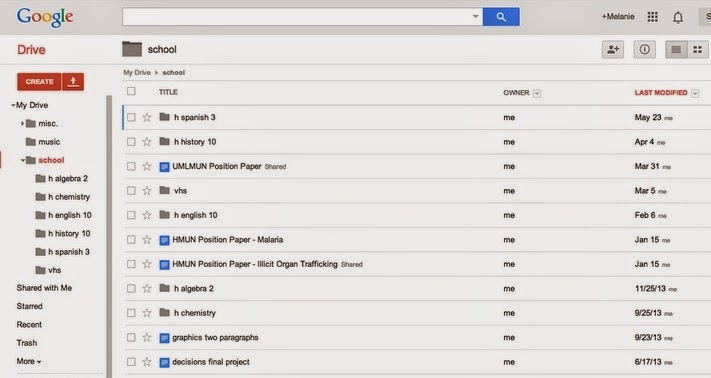 Image A: Melanie, an 11th grader, shared this screenshot of her Google Drive screen to demonstrate how easy it is to organize her work and save it. 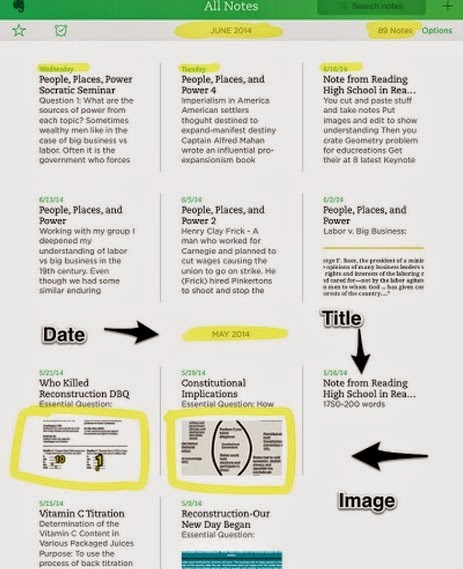 Image B: Tessa, a former student of mine, created this annotated screenshot to show how easy it is to find her notes in Evernote. 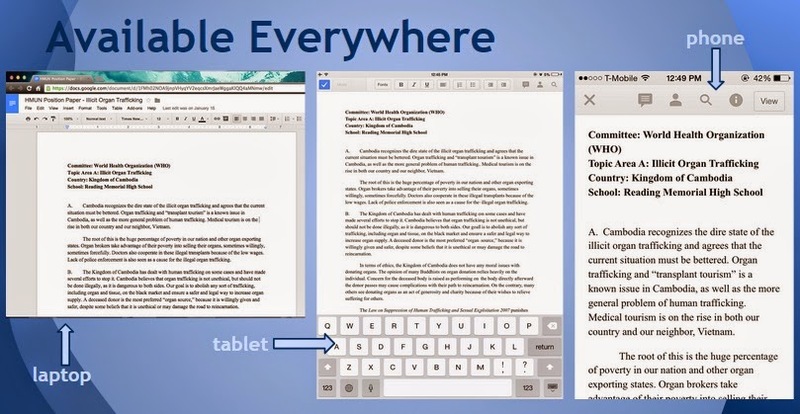 Image C: Simone, an 11th grader who presented with me at a conference last spring, shared screenshots showing how she can access her Evernote notebook on her tablet while at school and on her family laptop when working at home. Image D: Melanie presented with me at a summer conference and created this slide showing how she can access and work on her essay drafts from different devices. 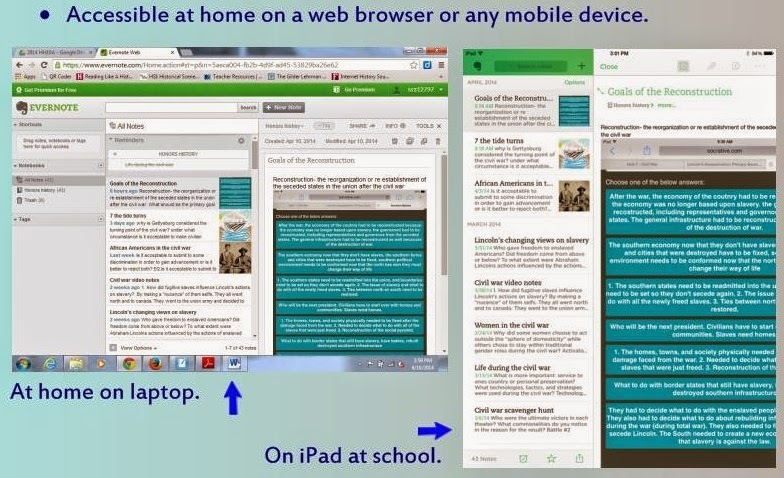 Image E: Our school uses Edline as a website platform. Students can access class notes, links to audio/video/text resources, assignment instructions, and can even submit work there. Typically I create a QR code for them to scan at the start of class that brings them to the page with the lesson resources. Even student introverts can participate more using paperless collaboration tools like Padlet to post their ideas without having to raise their hands and speak out loud in class. 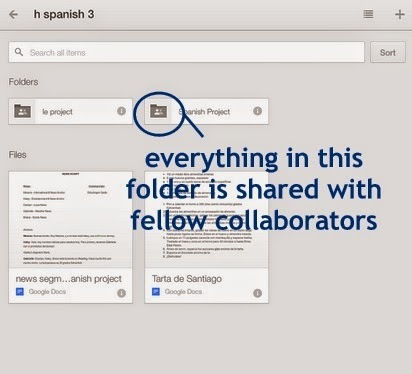 Image F: Melanie shared this screenshot of a Google Drive folder she created with a small group of classmates so they could easily collaborate and and create what they needed for a Spanish project. While there are challenging days in a paperless classroom -- when an app doesn’t work as expected or when our wifi network is slow -- the benefits for long term learning outweigh these potential bumps in the road. I am now a full month into the paperless classroom with a new crop of 9th and 10th graders. At first they were worried, but they are learning to troubleshoot their own tech obstacles and are seeing the way a paperless class actually makes their lives easier. Some may argue that technology takes away from academics and that teenagers are too hooked on their phone screens. When I was in middle and high school in the 1990s, my friends and I would constantly write and pass notes to one another during class. This did not prompt teachers to stop letting us use pencils and paper as a learning tool. Instead they created new, more engaging lessons, and encouraged us to use the paper and pencils to create worthwhile writing that others might want to read. Similarly, the teenagers in my classroom are not going to stop Snapchatting, but I can show them how to use their phones to save class notes in the cloud, access video and article resources, collaboratively create a multimedia class presentation, and publish all their ideas on public blogs for an outside audience. A paperless classroom might not work for every teacher and every group of students, but the benefits for student learning in my classroom have proved that it is a worthwhile approach. About the Author: Kerry Gallagher has been teaching middle and high school history in Massachusetts for 12 years. Her classroom is paperless. Students use their own smartphones, tablets, and laptops to access content, collaborate, and create original work. 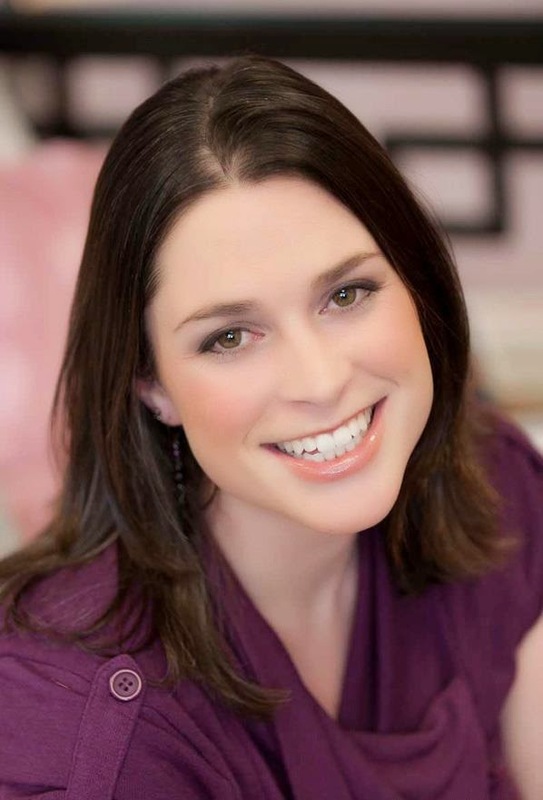 Kerry won the 2014 Yale-Lynn Hall Teacher Action Research Prize for her submission on the use of mobile devices for a paperless public school classroom. She has spoken at conferences like the Blue Ribbon Blueprint for Educational Excellence Conference, MassCUE and the Yale Education Leadership Conference. In addition to teaching history, Kerry is the Mock Trial Team coach and a licensed attorney. Most recently she founded the Rockets Help Desk, a student-run group that produces tutorials to help students and teachers access technology and other resources at their school. Read more of Kerry’s lessons and teaching strategies at her blog Teaching HistoryTech and follow her on Twitter @KerryHawk02. 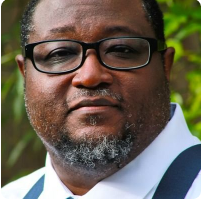 Great post Dr. Will! In my EDM310 class at the University of South Alabama, we actually are completely paperless, and we utilize tools such as Google Drive all the time. Despite having mixed feelings initially, I, personally, love the paperless movement!